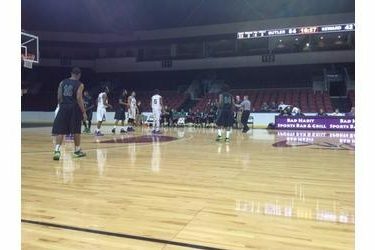 Butler outlasted Seward 99-98 in double overtime Friday evening at United Wireless Arena in Dodge City. Seward was 26-53 at the line for 49 percent at the free throw line. The Saints were 9-21 at the line in the second half and 7-16 in overtime. the Saints led by as many as 11 in the first half and trailed by as many as 12 in the second half in a game which was tied 42-42 at the half. SC led by five in the closing seconds but couldn’t make enough free throws down the stretch. Kevin Smith hit 7-10 three pointers and scored 27. His seven three pointers are tied for second most in Saints history. Niem Stevenson had 18 points and eight rebounds. Secean Johnson added 16. Butler’s win snaps a Seward six game win streak against the Grizzlies. The Saints are 3-4 and face Raleigh’s Finest Saturday at 2. The Grizzlies are 7-1.